Tap into the power of limits. Let your hangers create limits. While organizing, edit enough hanging items so that when all of your clothes are clean, you still have a handful of empty hangers to spare. Also edit enough so that it’s easy to slide clothing along your hanging bar when selecting your outfit for the day. As you purchase new clothing and notice you’re running short on hangers, use this as a signal to edit clothing and stay within the limit set by your hangers. Make hidden storage areas “off limits”. One of the most common things I find when organizing closets for clients is the use of hidden storage areas for storage. Using hidden storage areas, such as shelves that get covered by hanging items is an organizational problem for a few reasons. First, your hanging items can get all bunched up and wrinkled. Second, your closet probably won’t look as neat as you were probably hoping. And, third, if you’re an out-of-sight-out-of-mind person, then you’ll probably forget all about the stuff you’re storing in these hidden spaces. You’ll find your closet works better for you if you limit the items you keep so that you’re only using the easy to see and access storage areas in your closet. Use storage solutions to create limits. Establish specific storage areas for certain items. And then, live within those limits. For example, if you have storage space for X pairs of shoes (such as X plastic shoe boxes, or X cubbies in your shoe organizer) then you know that this is your limit for shoes. 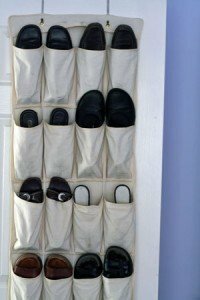 When you run out of spaces to put new shoes…use this as a signal that it’s time to let on old pair go to create space for something new. 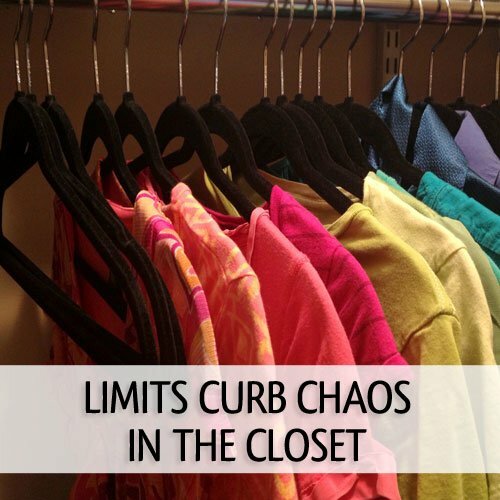 With the power of limits on your side, you’ll find it easier to organize your closet and keep it that way, too. What tips and tricks do you use when organizing your closet? I’d love to hear your ideas in the comments! Aby Garvey is a creative organizing expert and simplify 101’s founder. She has created 14 online organizing classes, which she has been teaching since 2007, helping thousands of people around the world get organized. Aby loves to help people create positive change in their lives through her online classes and organizing eBooks. Such a good rule of thumb (where in the world did that saying come from…?) for the whole house! We are many in a small house and I’ve been forced to TRY to live that way. It’s definitely an ongoing process in each room/space. Growing up, I was taught to find more storage area, and I’ve had to relearn. But placing limits is the most freeing thing ever. It’s saved me from all impulse buying, for one thing, because of the dread attached to finding more space or having to make tough decisions later. Thanks for sharing Amy. Great question about “rule of thumb.” I have no idea where it came from! Love that you are learning new rules and ways that work for you! © 2004-2019 simplify 101, inc. All rights reserved. Disclosure + Legal Stuff.